The early morning walks that have put an aura of fitness and willingness to talk to people around new president Cyril Ramaphosa have spun off to his soldiers with a healthy lifestyle programme for senior management of the SA National Defence Force (SANDF) launched this week. A defence force statement has it as follows: “Following a resolute decision taken by the Military Command Council (MCC) to proclaim sport participation compulsory in the South African National Defence Force (SANDF), the Chief of Human Resources (CHR), Lieutenant General Norman Yengeni, in his capacity as the custodian of Physical Training and Recreation, launched a Healthy Lifestyle Programme for the senior management cadre of the SANDF”. The statement, issued by Brigadier General Mafi Mgobozi, Director: Defence Corporate Communication, continues: “The programme focuses mainly on health and wellness. 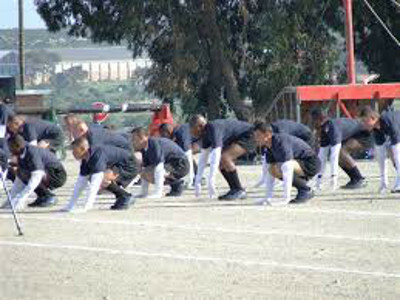 The primary objective is to promote and enhance fitness levels amongst members of the SANDF. With this launch, a precedence has been set for all Chiefs of Services and Divisions of the SANDF to launch similar programmes for all members and to ensure that these programmes are monitored and feedback is given to the MCC quarterly to ensure prolonged sustainment of the various programmes. It is expected of each and every member of the SANDF to ensure that fitness and wellness are prioritised. Fitness and wellness ensure that soldiers are and remain combat ready”. It concludes by stating that “true to the example set and comments pronounced by the Commander-in-Chief, the Honourable President Cyril Ramaphosa on Wednesday, March 7 on promoting and maintaining a healthy lifestyle (#TummyMustFall), the SANDF command cadre is steadfastly resolute in enforcing the Chief of the SANDF’s (C SANDF) drive to make physical training a top priority amongst the rank and file members of the military”. The programme was launched at the Armscor sportsgrounds immediately south of SANDF headquarters. The statement does not go into any detail about exercises the one, two and three star generals and admirals will do or alternative nutrition regimes offered to them. There is also no mention in the statement of Brigadier General Andries Mauyoma’s involvement in the programme. He is the SANDF director responsible for physical training, sport and recreation. Some years ago then SA Air Force (SAAF) Chief, Lieutenant General Carlo Gagiano, instituted a weekly walk for all personnel working at air force headquarters in an effort to boost fitness levels. It is not known how long the walks lasted but defenceWeb on three different occasions saw men and women spill out of the gates at headquarters and set off determinedly in Gagiano’s wake.